The plank is a fitness mainstay for good reason. It’s one of the best exercises out there for your abs, and it doesn’t require any equipment. For many people, though, the plank may start to feel pretty stale after a while. One way to mix it up, and to work other muscles in the process, is to try some plank variations. The side plank gets quite a bit of love, but a neglected plank variation that you should be doing is the reverse plank. The reverse plank is the perfect complement to the traditional plank since it works the posterior muscles of the core, namely the lower back, obliques, glutes, and hamstrings. Like the traditional plank exercise, the reverse plank is a bodyweight exercise that is done without equipment. Like the name suggests, the exercise is essentially the opposite of the traditional plank. The body is in the same position, only facing up. The heels rest on the floor instead of the toes. The arms similarly support the body. In the yoga world, the reverse plank is known as purvottanasana (upward plank pose), a word that means an intense stretch of the whole body. Begin in a seated position with your legs straight in front of you, heels on the ground. Bring your palms to the ground, directly in line with your shoulders. Your palms should be just slightly behind your hips. Spread your fingers out a bit for a wider base of support. Lean back at around a 45-degree angle and then bridge your body upwards. Do this by pushing your heels and palms into the ground, while bringing your hips up towards the ceiling. You can let your head drop back slightly, but try to ensure your body is in a straight line. Engage your core and squeeze your glutes while breathing steadily. Hold the position for your desired length of time. Beginning with a few sets of 10 seconds is a good place to start, but you can work your way up to doing a few sets of 30 seconds or 1 minute. Depending on injury and mobility issues in your wrists and shoulders, you might have to adjust your hand position. If having your fingers point backward towards your head is too difficult, try the fingers pointing to the side at a right angle from your body. If that is too difficult, try resting on your forearms rather than your palms. After mastering the reverse plank, you might want to make it a little more difficult. Try supporting your body on your elbows, rather than your palms, to engage the core even more. You can also try lifting one leg off the floor at a time and holding it out straight for a few seconds, then alternating legs. Or you can try resting your legs on an exercise ball. A final variation to try is called a reverse tabletop plank, wherein in your body is held parallel to the floor with your feet firmly on the ground and knees bent at a 90-degree angle. Each of these variations will engage the muscles a bit differently. Begin with the basic reverse plank and once you work up to holding that for a longer hold, start trying some of these variations. As you’re holding the reverse plank, pay careful attention to your body. If you’re struggling to hold the pose, it’s best to release rather than fighting it. If your hips start dropping or your abs are sagging, you’re not doing yourself any favors by trying to force it. You need to keep your pelvis in a neutral position. You don’t want your pelvis to be either too high or too low. In fact, you could end up injuring yourself. Hold the pose as long as you can with the correct form. Never try to go past what your body is able to do. Your hold times will increase over time. But you also shouldn’t worry about trying to hold for too long. The reverse plank is great for your overall health, as an exercise that helps build your strength and flexibility. It’s a killer exercise for the core, and it’s especially crucial for strengthening the often overlooked posterior muscles of the core. In addition to building the core, it also helps strengthen the arms, shoulders, chest, and even the muscles of the hands. It’s a great stretch, especially for the frontal deltoids, and it can improve your overall posture. Low back pain may be lessened after doing this exercise over time. It can even help aid fat loss, especially when done in conjunction with a carefully balanced diet. Another benefit of the reverse plank is that it is a pretty safe exercise. Because the exercise strengthens the core, it also helps minimize your risk of injury from all of the many activities we do that rely on core strength. As great as it is for health, many people love the reverse plank because of what it does for shaping the body. It can really help you sculpt your ideal physique, by toning all the areas you want toned and helping shape your middle. Finally, it can be a meditative exercise that can help calm and focus the mind. As with all exercises, it’s never a good idea to focus on one thing to the exclusion of all others. The reverse plank is a great complement for the traditional plank and the side plank as well as other body weight exercises. It also works best as part of a fully balanced program that includes cardiovascular exercises and strength training. 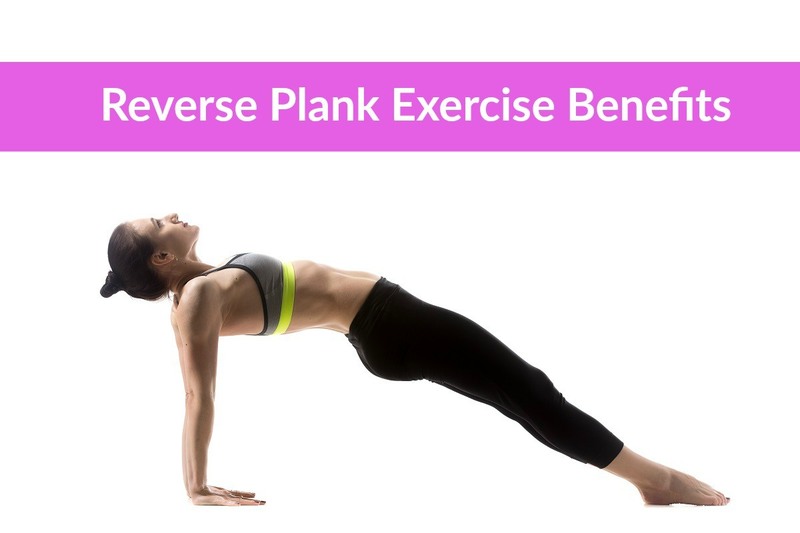 When done in conjunction with a balanced diet and a balanced exercise routine, the reverse plank is a great exercise that will lead to results in your health and your physique. It’s always a good idea to have a trainer check your form to make sure you’re following the proper procedure. Good form is key to the exercise doing what you want it to. To mix up your exercise routine and do something a bit different from the traditional plank, the reverse plank is the way to go. This powerhouse exercise works the important posterior muscles of the core, and it will improve your overall health as well as help sculpt your body and improve your posture. » Sit on the floor with legs in front of you. » Dig heels and palms into the ground while raising pelvis toward the ceiling. » Breathe and hold the body in straight line, allowing the head to drop back a bit. » Squeeze and focus on your abs and glutes. » Don’t hold any longer than you can keep quality form.